Shown in White/Black�Organza bodice with sheer neckline. 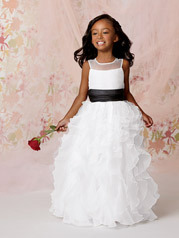 Full ruffled skirt with attached organza sash. Available in ankle and floor lengths. Available in any combination of two colors.